Since my last six swatches have been from Essie’s Retro Revival collection (some new, some originals), I’ve decided that for the rest of this week, at least, I’ll be focusing on some brands that are either new to me or that I haven’t swatched in a very long time. There’s quite a large selection of shades available, and I went with one that looked a little more unique to me. June is Here reads more like “December is Here”! It’s a pale, greyed, chalk blue cream. I wasn’t expecting much, but for a pastel, this polish applied really well! Two coats gave me full and mostly even opacity. Application-wise, it certainly outperforms many pastels from salon brands. For the very low price, I think this is quite a great deal, and I look forward to adding a few more Amours to my next NailSupplies.us order! 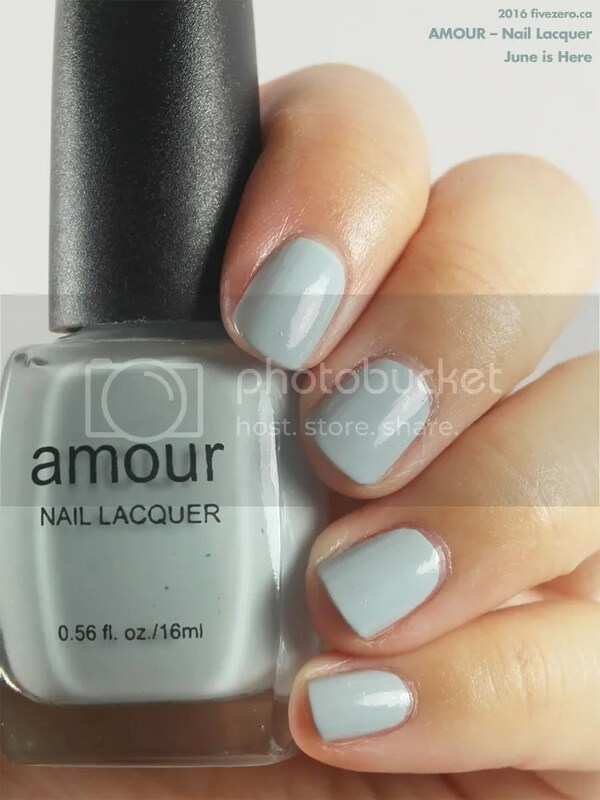 Amour Nail Lacquer can be found at NailSupplies.us (formerly TransDesign), where it retails for US$2.75. It is 0.56 US fl oz / 16 mL. 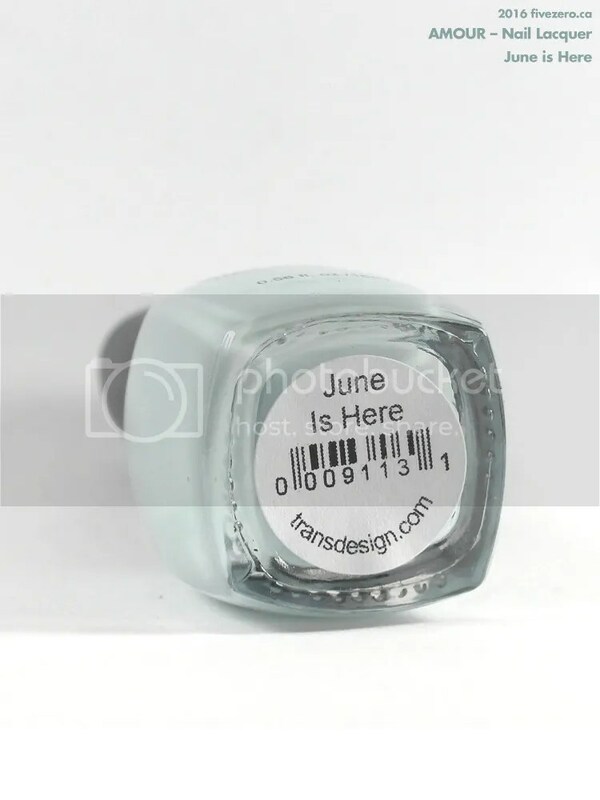 I am assuming they are a NailSupplies/TransDesign brand, as the label on my bottle says “TransDesign”. Oooh I’m all about greys lately! This is lovely, and what a bargain. I remember when I used to order from Transdesign… sigh, those were the days. Thought you might like this one! I am not usually one for greys, but this one seems to wear pretty nicely. I totally miss ordering from those places! TD, 8ty8 and H2T! I think there was one more, maybe AveYou? But then USPS prices shot up, gah! I’m lucky enough to be able to have family bring up packages for me; otherwise I don’t think I’d bother. This is such a beautiful colour and perfect for the spring/summer. I keep a “list” of shades I want to try so I’ll be keeping an eye out for something similar. I’ve checked it again and let me describe it as duck egg blue -yes, that’s the right hue for this shade. Oh I absolutely love this one. What a great shade. Hadn’t heard of the brand, but this looks great.